I recently wrote about the stool’s diagnostic potential and how you can tell if you’re healthy by simply observing your poop. Urine, too, can tell you a lot about what’s going on inside your body. Learn to note your pee’s color, smell and consistency, as this can give you some valuable insight into the well-being of your internal organs. Again, don’t jump the gun if you notice something remotely peculiar. But don’t ignore the changes either. When you feel something isn’t right, your urine’s characteristics can be a starting point for a discussion with the doctor. 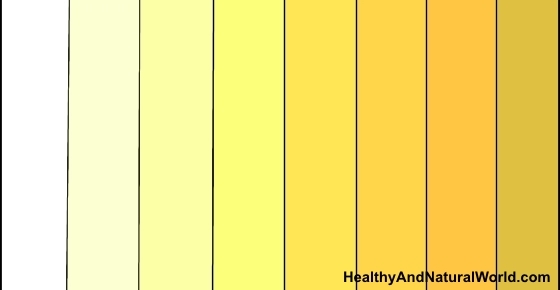 When you are decoding the color of your urine, the first thing to consider is your level of hydration. Most often the changes in color can be attributed to how much (or how little) you’ve been drinking. The second thing that can color your urine in an unnatural way is food. And then there are also some medications that can affect the urine’s appearance. So consider these circumstances first before moving on to more sinister causes of color change. Clear urine is usually a sign of being well-hydrated. However, in some cases it can signal that you might be drinking too much and are risking water intoxication (and I’ve written about it in my previous article why drinking too much water is dangerous). Over-hydration means that you are drinking more than you need and you might be harming your body by overly diluting the salts. This doesn’t usually cause any serious health issues, but just don’t force yourself to drink beyond what you need. If your urine has no color at all, this can also be a sign of diabetes. The accompanying symptoms include constant thirst and frequent urination. If you feel you need to drink all the time, it might be worth taking a diabetes test. You can also find here more warning signs of diabetes. A straw yellow color is the color of healthy urine. As the color becomes darker, this can be an indicator that you are becoming dehydrated and need to drink. When your urine gets more concentrated, this is usually accompanied by a stronger odor. Some foods, too, can make your urine dark yellow. For example, beets can make your urine darker. When your urine color starts getting very dark, possibly with shades of brown, this can be sometimes attributed to dehydration. It’s the body’s urgent call to refuel on fluids (and you can read here what happens to your body when you are dehydrated). However, it can also be a symptom of an underlying condition, so you might need to get it checked. People with liver disease can have brown urine. If your liver is not working properly, the bile salts that should be eliminated with feces might end up in your urine. Hepatitis, an inflammation of the liver, is an example of a liver condition that colors pee dark. Red is usually the most alarming color. Even one occurrence of unexplained red tint should prompt you to see the doctor and get it investigated. Red or pink can come from certain foods and substances you ingested, so you need to rule this out first. Foods that give urine a red shade include beets, blackberries and rhubarb. If you can’t attribute the color change to food and it happens more than once, this can also signal that there is a serious health problem. Red color can come from blood in the urine, a condition known as hematuria. It can be caused by a number of reasons, some benign and others of a more serious nature. Urinary tract infections, stones in the kidneys and bladder or some cancers of the kidney, prostate or bladder can all cause bleeding and color your urine red. Urination can be accompanied by pain in these cases and it might be difficult to urinate. Under some conditions, urine can have a bluish tinge to it. This is most commonly caused by certain foods and medications that contain dyes. There is also a rare condition known as porphyria – an inherited enzyme condition – that can make the person’s urine blue or purple. Again, the most likely cause behind a bizarre color of your urine is food. Asparagus is the main culprit (you will also notice a distinct smell after you’ve eaten it), but the greenish tinge can also be down to eating black licorice or any food that contains strong colorings which don’t get absorbed in your intestines. Medications, too, can make your urine greenish, for example, the antibiotic rinsapin. Also, if there is some pus in the urine, this can make it green-looking. Urinary tract infections are the most common cause of that. Sometimes, something else can get mixed into the urine and make it appear outlandish. If you’re suffering from diarrhea, it can make your pee look green or brown, even if the color is not coming from the urine itself. Your urine can even get black, which is not necessarily something to fret about. The causes can be divided into three groups: food, medicines and chemicals, and health issues. If you can rule out the first two, it’s time to see your doctor and get it checked. Milky urine with sediment can signal the presence of microscopic blood. It can also be caused by a urinary tract infection, bladder infection or kidney stones. Some sexually transmitted diseases can change your urine – gonorrhea is one example. Vaginal discharge can make the urine cloudy, too. Foamy urine shouldn’t be too much of a problem; it usually just shows how strong you are urinating. In some cases, however, it’s caused by the presence of proteins and needs to be investigated further, as it can point to a kidney or gallbladder problem. If you continually experience bubbles in urine, go and see your doctor.